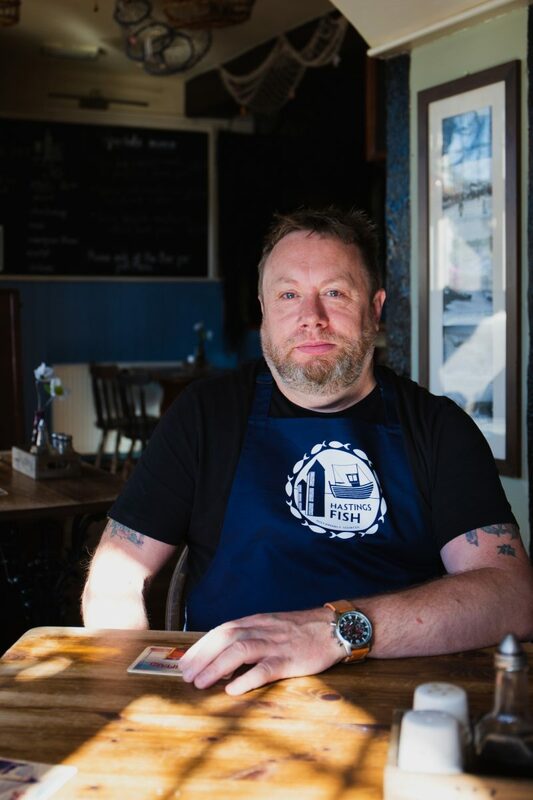 Marcus, head chef at Dolphin Inn Hastings, is a long term loyal customer of the Hastings fishing fleet. His knowledge and enthusiasm for Hastings-landed fish is impressive; when you visit The Dolphin Inn you'll notice information on the menus about the type of fish available, along with encouragement to try other types of fish aside from the traditional 'cod and chips' on their popular Fish & Chips night. "Our main fish and chips is Huss, from John and the brothers sometimes Richard or Uckle. The famous fish platters consist of Plaice, Gurnard, Whiting, Jacks, Pout, Whiting and Flounder from John, Richard or Obie. Our popular 'Dabs and Bread & Butter' is from the huts just over the road and I invented our fish goujon basket to use up anything that was left, which has also proved very popular! Using local fish means having to work with what's available - we have a good relationship with the fishermen and it's important for us to support them." The Dolphin Inn is open seven days a week from 11am.